U.S. Patent No. 9,885,169, the Automated Backslope Cutting System Patent, was recently granted to GK Technology, the developers of the SD Drain® Ditching software package. This feature adds automatic blade control while cutting the sides of a surface drainage ditch. Surface drainage ditches on farm fields quickly remove excess water after heavy rains. If excess water remains on the field, it can damage crops, reducing yield and profitability. An SD Drain® GPS Ditching System will design a cut path and automatically control the blade of a farmer’s scraper as they clean out existing ditch bottoms or cut new ditch bottoms. An SD Drain® Ditching System will also automatically smooth out the sides of the ditch, commonly referred to as backslope cutting. After finalizing the design of the ditch bottom, the operator can move the scraper to the top of one of the banks of the ditch, lower the blade to the ground, and SD Drain will calculate a backslope value that can be entered into the program for automatic blade control while backslope cutting. SD Drain® operators have the option to add a slope sensor to their ditching system allowing for even more accurate blade placement during the Automated Backsloping operation. Rust Sales, Incorporated is the exclusive worldwide distributor of the SD Drain® product line, which also includes SD Drain® Tile, a system for automatic design & installation of drain tile runs. SD Drain® systems include software, hardware, and a touch screen panel PC to design, guide, and control scrapers, tile plows, rotary ditchers, & blades. 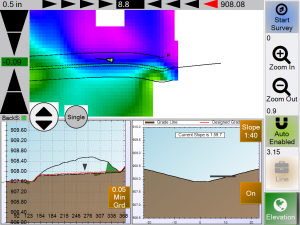 Pre-planning drainage software is available through GK Technology. For more information on the SD Drain® product line, or to inquire about dealership opportunities, contact Rust Sales, Incorporated. With the Automated Backslope Cutting Feature turned on, and a slope sensor installed, blade depth is calculated from the lowest outside blade position. If no slope sensor is installed, blade depth is calculated from the bottom center of the blade. © 2019 Rust Sales, Inc.